I have a new treadmill workout for you today! I am skipping our usual dinner plan post because after today, it’s winter break time which means we won’t be home like we usually are during a normal school week. We won’t be away but our plans will involve more time out to eat and less time in the kitchen which is always welcomed from time to time! Anyway, the treadmill workout. I think you will like it! I ran it a few times and find it fun yet challenging, in a good way. This treadmill workout is great because it allows for a good warm up followed by engaging intervals with the option to either hold at a specific pace or play around within a pace range. Normally I do not give specific speeds for my workouts since we all run at different paces but for this one, I am including exactly what I did. Please feel free to modify it! Go at your pace which may be faster or slower. I recommend that if you want to modify the workout to your speeds, pick a warm up pace and then bump up accordingly. My warm up pace starts at 6.3 and goes no higher than 6.8. I really try not to go faster during a warm up because it can backfire on me, fatiguing me rather than energizing me which ruins the duration of the run. I like trying to hold at 7.5 because I want my legs to think an 8:00 min/mile is comfortable. The more I hold steady at this pace on the treadmill, the better able I am to run it naturally outside with less effort. I have absolutely seen the benefit when I run outdoors! I am running faster out there (when I actually get out there) and the fast paces definitely feel easier to the point where I am shocked that I am running so fast. I give small pace ranges in case you are like me and like to play with the buttons but you can hold steady instead. Those half miles do go quick when you are going fast! And one more thing to remember, the treadmill is a machine, you aren’t. Some days this workout will feel awesome and sometimes, it may be way too hard. Pay attention to how you feel – if you need to slow down, slow down or even stop! Not every day should be a challenging workout. If you are due for an easy run, scale back your pace and play around in your easy pace range or save this workout for another day. My Favorite Running Workout < – Not specifically for the treadmill but you can adapt it! Will you be running outdoors or on the treadmill this weekend? Are you off on Monday? Yup I’ll be outside tomorrow morning but luckily my rest days seemed to be timed with the coldest mornings. Not that tomorrow’s 18 will be warm, but it’s not -3 at least! OMG Sunday morning is looking brutal – I am hoping tomorrow morning can be like today so i can run outdoors. So we have the “Local Option” Half Marathon tomorrow (the goal “race” for our Winter Warriors gang) and they just told me yesterday that I am on for it. Um a) I don’t do cold and b) it is supposed to be single digits (or less). I am going to die. Love this workout! This is usually how I run on the treadmill- keep going faster and faster. Love it! I have been on the treadmill all week due to single digit temperatures. I’m actually not hating it. I get to catch up with my gym buddies and watch the news 🙂 My favorite candy is white chocolate Reese’s cups. No day off on Monday for me. Enjoy your weekend! The treadmill can be so awesome and definitely break up our routine so it feels refreshing but ugh, I have run so much indoors already, I don’t feel like it anymore! working from home Monday is so much better than the office, it’s not a full winter break like the kids get but it’s something! Being an adult is so not as fun. I think my 9 miler will be indoors tomorrow–it’s going to be too bitterly cold outside! I’m baking red velvet cream cheese brownies this weekend for Valentine’s Day, and I’m so so excited to be off Monday! Long weekends are the best. Have a good one! I love workouts like this for the treadmill because of variety! I ran mile repeats on the treadmill yesterday because I just wasn’t feeling up to them on the roads and the variety definitely helped time pass. Have a great weekend! You know I like my variety 🙂 I am all for the treadmill but lately I have been inside so much that I am starting to lose it! I need an outdoor run every few days in the winter to stay sane. Pretty sure I am taking my runs inside this weekend, actually kind of sad about it and as we know, I am a treadmill fan. I have just been really enjoying the long run outdoors! Looks like we are out of the super cold after this weekend, although there might be rain on the horizon. Sigh. I know, the long runs are so much better outside! I am going to decide in the morning where I will run – if there’s a big wind, no way am I running outside. To be honest, with the cold weather I have no issues with running inside. I would rather be happy indoors than miserable outdoors. Agreed. I have gotten much better at running indoors without caring but after a few days of running on the treadmill, I start to get antsy. Hey, this is a great workout! I’ll do it once I get Callum to bed. I have such a hard time maintaining certain paces on the treadmill that come easily for me outside. 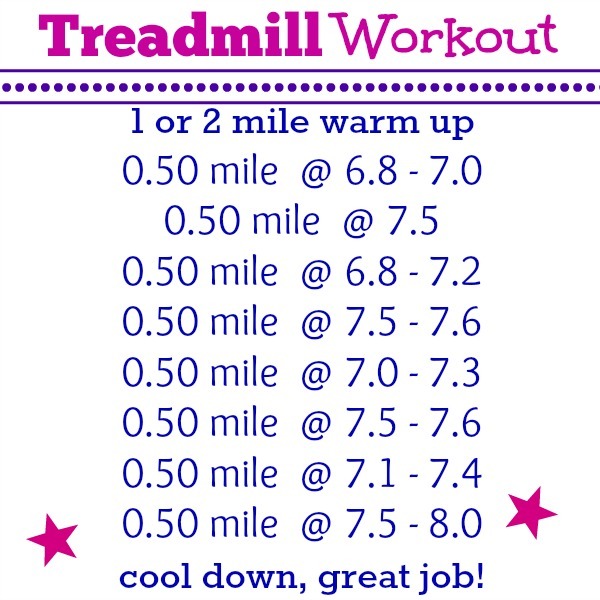 I can see how treadmill workouts like these translate into faster outside runs. Love it! Thanks for the idea. I’m always looking for ways to shake up the treadmill slog. Not sure if I will make it outside tomorrow due to the wind warning! I got in a longer run today (which was originally going to be a rest or yoga day) so if I don’t make it out that’s ok, but I would feel better if I could get a few miles in. I don’t have a treadmill option right now but if I do again at some point I will have to keep this workout in mind!